CORE is honored and excited to once again be the official charity of the VIBE Conference 2017, happening in beautiful San Diego, CA from February 28-March 1, 2017! 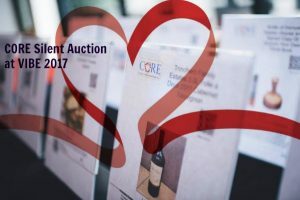 VIBE has consistently been one of CORE’s biggest fundraising events of the year, in part due to our annual CORE Silent Auction at VIBE. The 2017 Silent Auction will be available for bidding from February 20th-March 1, 2017. We would greatly appreciate a Silent Auction contribution of a unique or special item that represents your organization and affirms your commitment to CORE and the families we support. If you would like to donate an item to the auction and help us give back to our own, please complete the form below by February 17, 2017! Please note that the Silent Auction is electronic, and items can be bid on through a mobile device and will not be onsite. Thank you in advance for your help and consideration. CORE is forever grateful for your past and continued support, and we look forward to seeing you at VIBE 2017 or other events in the coming months!